American English: "Bump your opponents out of the way and aim for the jump blocks as you fall." British English: "Aim to land on a Jump Block. Fight your way down if you have to!" Not to be confused with Bounce 'n' Trounce. Trounce 'n' Bounce is a General minigame found in Mario Party: Island Tour. 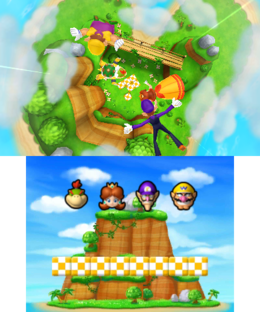 Its gameplay is very similar to Parachutin' Gallery's, a minigame from Mario Party DS. In this minigame, players must try to survive the longest by falling onto Jump Blocks, that send them back to the sky. The ones who fall onto the ground are eliminated. After each bounce, there will be fewer Jump Blocks. The last player standing wins. French Plus dure sera la chute "Harder will be the fall", from the French proverb equivalent to "The higher you climb, the harder you fall"
This page was last edited on April 15, 2019, at 10:20.